Francis Bathe was one of nearly 100,000 Canadians who participated in the Battle of Vimy Ridge, and was one of more than 7,500 soldiers wounded in the battle. Bathe was just 21 years old when he wrote this letter home to his older sister, while he was recovering from a shrapnel wound to his neck in a hospital in the north of England. He details, sometimes quite graphically, the tragedies of war. Yet this letter also brings to life an air of optimism about what the Battle of Vimy Ridge meant for the war effort. Francis Bathe has reached hundreds of Canadians through his story of military service through The Memory Project’s online archive. To read or listen to more veterans’ stories, please visit The Memory Project website (thememoryproject.com). I guess you will be a little surprised to hear that I am back in Blighty, but of course you can never tell when those shells are going to shake paws with you, especially where we were last Monday on Vimy Ridge. It’s just a week ago today when I got mine, of course we are lucky to get such lovely blightys. There was lots of them handed over that day but by gee we made fritzy beat it. I guess the papers told all the news and I have come to the conclusion that reading it out of a Toronto Empire is a little safer than doing the work, but there wasn’t a bad time that day. Of course there was a few of our lads napooed but nothing like so many as they expected. I don’t think. The greater part of them were walking cases like myself with just small wounds, mine was a piece of shrapnel; it went in about the shoulder blade and came out in my neck and made a small hole of course about 1 ½ inches long, 1 inch wide, but I can’t imagine why it is so painless. Of course I’m not kicking but I was a little surprised at the size of it when it doesn’t hurt so much. I think I will be a long while before I can carry a pack again, but being a flesh wound it may heal quickly, and the only thing is it made my neck a little stiff and makes me hold my bean sideways, but it will get over that alright. stretcher bearers and by that time he was gone. His two legs severed at the hip and poor lad was better dead. We captured about 3,500 that morning, and I should judge about as many were killed or wounded besides that. I think the 1st and 2nd Divisions did equally as well, by what I heard they were chiefly the Bavarians at that. They are notable fighters but our lads were better. Of course our lads had one thing ­— a good artillery fire ahead of them but they said about one half of the casualties were done by our own shells. Of course you can’t expect much else when they keep up within 25 yds of our barrage and some of the shells fall a little short but it was wonderful. According to plans there were 5 shrapnel and 5 high explosive shells beside dozens of smaller ones which dropped anywhere to every 18 ft. We were lucky not to have to go over the top but were in supports and reserves. We left our little rabbit holes in St. Eloi wood at eight and went up to consolidate the trenches and dig a communication between ours and fritzys front line, that was where I got mine. By gee some of the lads were glad to get hit and come back, but you would be surprised to find out what wonderful spirits our lads had that night. They had a hard task but then it is a known fact the Canadians generally do the hard jobs better than most and are always just in the tough spots. The French lost 80,000 in capturing Vimy; before then they handed it over to the Imperials and they turned round and lost it, so you can imagine what a place it was. You see it’s a ridge and those who hold the top of the ridge can look down over a stretch of 12 miles of fritzys territory and now they will rattle Sam Hill out of him. You see if they couldn’t move him from the ridge. Why if you look at a map, they were almost at a standstills but they took it and now fritzy will have to hike out. The papers give a very good account of it. There was only one correspondent that I saw around where we were and he came out of a dugout about 25 or 30 ft down. By gee the Germans had tunnels and dugouts and caves about 60 to 75 ft down, and in most of them were electric light so they thought they wouldn’t have to move for a little while, but their lease expired Easter Monday and he certainly left the rent on the mantelshelf and beat it. You could see Battalions of them going through a village and they opened the liquid fire on them, and poor mortals didn’t like to take their own medicine; they handed over to the lads a year or two ago when they had us beat, but now we give it to them with their full interest. If they weren’t driven to it they wouldn’t do a great deal of scraping, but of course some will fight and it will take a few months to finish it yet. But this summer will do it alright. February is Black History Month, a time to celebrate the many achievements and contributions of Black Canadians, past and present. Randolph Hope was one of many who served his country in the Second World War, as part of the Canadian Merchant Navy. While many Black Canadians were subjected to discrimination at the time, Mr. Hope explains that he was spared this experience, which he attributed to the environment of camaraderie and threat of danger on the ships. Mr. Hope has reached hundreds of Canadians through his story of military service on The Memory Project’s online archive. This transcript has been edited for clarity. His audio interview is available on The Memory Project website. fter the war, Randolph Hope played football for the Saint John Wonder, 1960. When I joined the ship, we had what they called DEMS [Defensively Equipped Merchant Ships]. [On] these DEMS, we had Oerlikon guns [anti-aircraft and anti-submarine autocannon] and [M2] Twin Brownings [anti-aircraft heavy machine guns]. And they were there to protect our ship. Now, our ship also carried torpedo nets to protect us in case the Germans or Japanese fired torpedoes at us. Those were no help because the person would just blow the net wide open and come on in. It just gave us false security. You say, oh boy, you know. 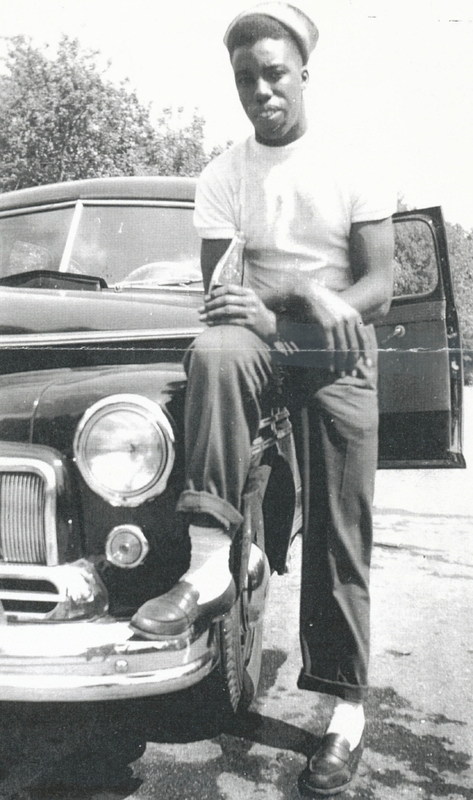 Post war, Randolph Hope is leaning on a car he rented to drive to Montreal, Quebec. It’s just like [Winston] Churchill said: if they had have stopped the merchant navy, most likely Germany would have won the war. And that is true, because we took light ammunition, the food and everything else. And you know, and not only that, but we supplied food and stuff to Russia on our Murmansk Run. If you could have stopped the merchant ships going to England, they’d have won the war. I remember I was in Liverpool and the American army coloured guys were there and their army was all discriminatory. And that didn’t stop until I got into Labrador here in 1951, I think. That’s a question a guy asked me when I was up on the [Parliament] Hill there. You know, one of them politicians. They said, “Did you ever run into any discrimination in the merchant navy?” I said, “I’ll tell you this.” I said, “When you’re on a ship, everybody don’t look at your skin, they don’t look at it.” When a ship got torpedoed and you’re on a life raft or on a boat, and the guy happened to come up and if he was black or French or whatever, and you reach down to help him out of the water, you don’t say to him, oh, I’m not going to get him up, he’s not one of us. No. There was no discrimination. We were a real tight group of people. And that’s the way it always remained all through the war. And that’s what I liked about it. The Korean War had contentious beginnings, and its very distinction as a war was highly debated. Over 25,000 Canadian Forces members served, 516 of whom died in Korea. The Memory Project is committed to honouring the stories of those who served there. Leonard “Scotty” Wells was one such Canadian Forces member who served in the Korean War. In his testimony, he tells the story of the truth about Dr. Cyr, the great imposter, as well as what he describes as his most terrifying experience during the war. Countless Canadians have heard Mr. Wells’ story of service through his participation in The Memory Project. This is an edited excerpt of a longer interview. The full version is available on our website at www.thememoryproject.com. We worked with the ROK Navy [Republic of Korea Navy], and they were on small ships, maybe 30 people, or 20. And they occupied a lot of the islands behind enemy lines, and they still retain those islands. So our job was to help these people. They’d send us a message that they were running out of provisions or they had no rice left or something. We’d give them what we could. The [South Korean] guerrillas were always conducting raids on the mainland, so they would call us in for gunfire support. And they would go in, maybe 30 guys, and they would raid the mainland and steal whatever they could, green vegetables — anything — and bring it back for themselves. So we were doing a lot of gunfire support. They just called — they’d usually have a signalman or an operator with them that could speak enough English, that would say, “Okay drop a shell, so and so,” or “so and so,” and we would do that. I knew the number of shells we expended, but it was well over 10,000 orange shells. And we were shot back at quite a lot of times by small arms fire. They usually weren’t very accurate. There was a peninsula called the Am-gap Peninsula. We’d been up there lots of times before and we pulled up there this day. Because we’d been warned the day before that the guns had opened fire on another ship, so we were going to destroy those guns. We pulled in there, dropped the anchor — I don’t know why — and this was on the second trip over, so we had Commander [James] Plomer as our captain. The next thing you know, two shells landed and a great geyser of water came up and everybody got soaked on the quarterdeck. Then two more came in beside us. Now we were at anchor, so instead of pulling the anchor up they slipped it. There’s a chain you can knock and — we let the anchor go. We had to go back and get it a few days later. And we backed out of there. And we’d no sooner moved backwards than, right where we were sitting, there was a great shell explosion. If that had hit us, we’d probably have been blown up, you know. Anyway, we got back out of there, and then we called in the air — the planes from the carriers. And they napalmed the whole hill; they lit it on fire. I mean those napalm bombs, when they hit, you just see fire going everywhere. Unbelievable. The heat. But yet, a few days later, it obviously didn’t do any harm, because they were still shooting at people. They had their guns in caves, on rails. So they’d wheel them out, shoot, pull them back in. You couldn’t destroy them. Dr. Cyr was an officer. He was a short, kind of heavy-set guy. Not many officers would come into the mess deck of lower ratings like us, but he would often come down into the communications mess or the seamen’s mess and talk to you. He was a real nice guy. And I got needles from him — we were always getting inoculations for something. We were on a very big raid one day, and we were giving gunfire support — and I don’t think there was another ship there, except the ROK Navy. There was a few guys shot up and there were three or four of them brought back to our ship, which is normal. They were badly wounded, and I remember as if it was yesterday. I was sent back out from the bridge for something, and there were three or four stretchers laid out off the captain’s cabin. And Dr. Cyr came out; he’d just finished operating on one of these fellows. He was just dripping in sweat. You could see, I mean obviously the pressure the guy was under was unbelievable. But he was just dripping with sweat, and according to all records he actually saved their lives. He took a bullet near one guy’s heart out and his experience was, well, I think he’d had a little bit of medical knowledge because he worked in the Halifax hospital [at HMCS] Stadacona [Nova Scotia] before he went over. So anyway, we got a message about Dr. Cyr from my friend who was a decoder, a communications specialist. He decoded the message that Cyr was likely an impostor. The message was taken back to the captain, and the captain said, “I don’t believe it, it’s not possible.” So I guess he called Cyr in, and he admitted it. That he was an impostor and wasn’t a doctor. The next time we saw him it was a couple of days later. He was sent back to Tokyo, I think, flown back to Canada and discharged. We were way north of the 38th parallel [separating the Koreas], and we were ordered to drop two men off on an island behind enemy lines to count ships. So, myself, as a signalman, and Petersen, another naval guy, we were sent off in the morning in the ship to be dropped off on this island. And we were scared to death. They didn’t know for sure if there was anybody on there. We were armed with — I had a revolver, which had five shells. I don’t know why five, but it only had five. And Petersen had a Lee-Enfield [No. 4 Mk. 1 bolt-action] rifle with one clip of ammunition. That was our total ammunition. Able Seaman J.A. René Brunette was among the four per cent of Quebec residents that voluntarily enlisted in the Second World War. As a member of the Royal Canadian Naval Volunteer Reserve, Able Seaman Brunette was a part of the convoys protecting Merchant Marine supply ships as they made their way to England. The role of the Merchant Marine is often overlooked, but their ships crossed some of the most dangerous waters in the Second World War, helping essential provisions to reach a desperate England during the Battle of Britain. November 11th is Remembrance Day, the day we remember those who sacrificed their lives in war. Memory Project speakers are available to speak year-round and instill the importance of remembering, not just on Remembrance Day, but every day. Able Seaman Brunette’s audio interview is available on The Memory Project website (thememoryproject.com). I was French-speaking and I knew a little bit of English but not a lot, eh! At our house, we read newspapers like Le Droit and Le Journal, which existed during that time. My father always worked in French and English so we had a general idea of the language. In my line of work, I would say that it was often the English-speaking people who gave me a chance. When I boarded the ship, there were two gentlemen from Ottawa, one named Bonhom and another named Burke. We were delegated to that ship, and then the coxswain, who was the assistant officer and in charge of all the people, he approached me and he said, “If you have any trouble with those English, you tell me Brunette!” But he was English-speaking himself. His last name was Cunningham and he was from Dorval. They sent us to Sydney, Nova Scotia to board our ship. When we got there, we had to sleep in a big garage that had beds set up on benches. The next morning, when we got up and looked outside, there was a big ship called a corvette. We didn’t even know what that was! We boarded; we were three young men from Ottawa who were assigned to that ship. The corvette was called HMCS Hepatica. It was an English name, since the ship was based on a style of ship from England that served the coasts, so it wasn’t very wide. It was 33 feet wide and 200 feet long and there were over 70 people aboard. It was a bit cramped! There was a device called sonar, which was placed on the bottom of the ship. It was something like a barrel under the ship which sent frequencies underwater and received them again four times faster than they were sent out, so that we could detect a whale or a submarine or an old shipwreck or anything like that, or rocks or fish. It was very handy. It was early on during the war, and all the supply ships and things like that operated on their own. When the submarines detected them one by one, they had a chance to shoot. Mr. Churchill [the Prime Minister of Great Britain] decided that no ship should ever go out alone from any given place; they had to go out together in convoys. If we hadn’t been able to bring over the munitions, the food supplies, and things like that, the transport of the troops, then England would have been in trouble. It was Germans who were in the submarines. First off, the submarines: after [the Germans] invaded France, they were building submarines in Brest off the Atlantic that was the starting point. They were banding together in groups. Sometimes there were up to 20 submarines that banded together in a group to try and stop our convoys. Then us, the convoys, we managed to slip out to protect our ships, even though we had lost a lot of supply ships by then, we slipped out to protect them. Often people say that it was the Air Force that won the battle, but in our opinion, it was us, the Merchant Marine and the Navy who helped a lot and who helped to save England. Because if we hadn’t have been able to bring over the food supplies, the munitions, the shells and other things like that, then the Air Force wouldn’t have been able to move. Oil, gas, things like that; we provided the support. In my opinion, we were the backbone of the entire organization. Some of the frigates were built in Canada and they were given the names of cities. They were a bit bigger and faster than the other ships. The HMCS La Hulloise was a frigate that was a bit bigger and faster and it had 150 sailors aboard. It was more modern and was equipped with everything imaginable; sonar and we even had something new, a grenade called the “hedgehog” [an anti-submarine weapon]. It was installed on the ship’s front deck, in front of both cannons, and it could launch. It was about 21 inches long and 3 inches in diameter, and it could launch grenades ahead at submarines when they were close. We had just left the group, the convoy, and we were escorting ships to various different cities such as Liverpool and Southampton and places like that. So we were three ships together, two others and us, and we received an order to go patrol the Irish Sea around the northwest coast of Ireland. So we departed northwards and at around 11 o’clock at night, the radar picked up something. It indicated that there was a submarine ahead of us. We didn’t think that it could be possible. We were so close to the coast that we could see the red lights on the buoys, like on the Ottawa River. We were so close to land. The captain said, “How could it be?” And then the sonar repeated its signal that there was a submarine ahead of us. So, then we did something that we were never supposed to do during a time of war, but the captain took a chance: we approached and the captain turned on a huge spotlight so that we could clearly see the submarine. When it saw us and the light from the spotlight, it started to descend — to “crash” you could say — to lower quickly to the bottom of the bay. We relayed the coordinates to the two other boats that were with us and we started dropping charges/torpedoes on them. After a few minutes, say within 10 minutes of having started our attack, we saw some flotsam come up through the water. I would say that the attack lasted about 40 minutes all in all and then we started patrolling the waters again until the following morning. The next day, we went back to see if there were any survivors and there were none. There were 44 dead [submariners]. We even picked up a notebook that included a letter which a young marine was undoubtedly writing to his mother... He thought that he would be home for Easter. It was March 8th. I will never forget that date since my mother’s birthday is the following day. A lot of us cried and prayed for them; we were all under a lot of pressure. It was very touching, very touching.